There are many ways to play any scale on the guitar. 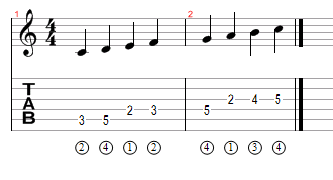 You can learn the positions of each note of a scale on a single string. 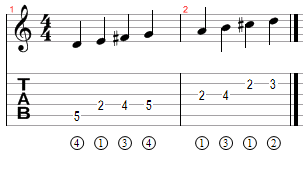 You can learn scales that play three notes per string then move to the next higher (or lower) string. However, many guitarists look for efficiency of movement. The best known method describing this efficiency approach is the CAGED system. Why CAGED? Well, first is that it’s a nice mnemonic to help you remember the names of the scale positions. 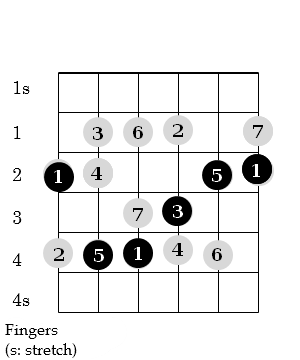 The positions are named after the major open chord positions on the guitar. The open C, A, G, E and D chords are among the first chords learned by most guitarists. 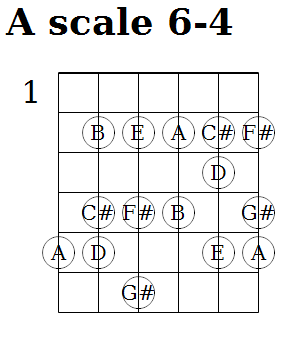 Closed position scales can be built around each of these chords forms. 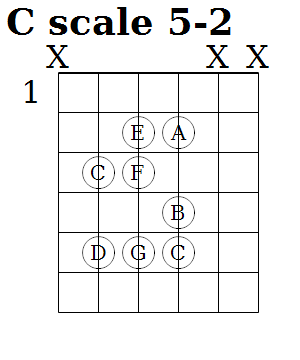 Another reason for scales based on these chords is there is a minimum of stretching involved. The intent is to assign each finger of the fret hand to one fret position. Unfortunately, the way the guitar is designed in standard tuning requires breaking this rule for some scales. Thus you are allowed to stretch either your first (index) finger to a lower fret or stretch your fourth (pinky) finger to a higher fret to reach some notes. 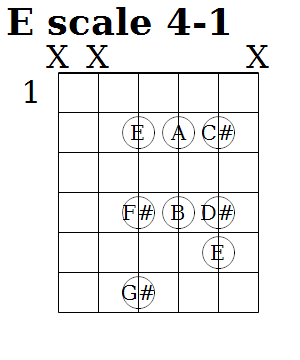 An alternative naming convention for these scales uses the string and finger of the fret hand that represents the lowest root note of the scale for the name. 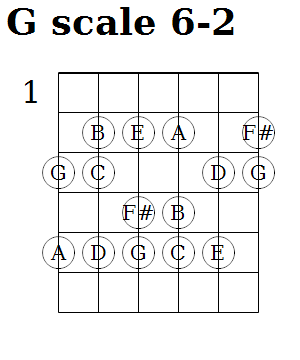 An example is the CAGED “E” form scale would be named the 6-2 scale in this alternate system because the lowest root note in the scale begins on the 6th string and is played by the 2nd finger. This will make more sense after you study the scale positions 1. Notice that the E or 6-2 scale form and the C or 5-4 forms don’t require any stretches. The A or 5-2 form doesn’t require any stretches for the octave on the low strings while the G or 6-4 form doesn’t require any stretches for the octave on the high strings. 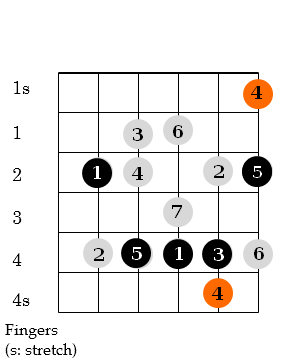 The D or 4-1 only covers one full octave and requires stretches. Also notice that the finger position for the low octave 6-2 scale are identical to the 5-2 scale – just a shift which string you begin on. 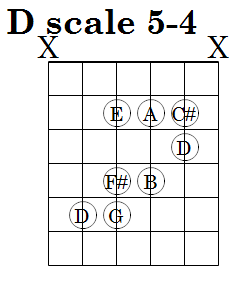 The following reduces the above generic scale shapes to specific scales, with tabs 3 and notes 4. You will have to figure out and learn the remaining positions up the neck. So, do you have to learn all of these in every position on the fingerboard? It depends on what you want and who you are. Serious, professional guitar players will know all of these positions and more. I’ve learned them all but am more proficient at the parts not requiring stretches. Then again, I’m not a serious professional, just an avid hobbyist. Perhaps the most encouraging thing I’ve heard was Jimmy Bruno (one of my favorite jazz guitarists) explaining that he mostly avoided the scales requiring stretches and got along just fine (huge paraphrasing there). I’m sure Jimmy Bruno knows all the positions – but I think his point was concentrating on being melodic or creating interesting solos is more important than learning many scale positions. Certainly, starting out with one position and learning it well seems like a good idea. Click on images to see enlarged view on single page. Circles on diagram are the finger positions for each note in the major scale. The black circles are the locations of the 1, 3 and 5 notes which make up the major chord. 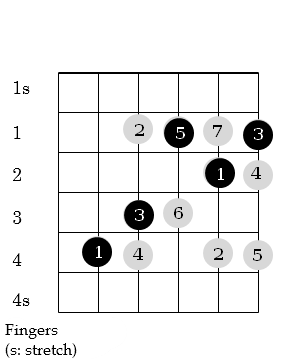 Imagine the chord shape of the black positions if a capo or the open position were at the lowest fret with a black circle and you can see the named chord shape. The numbers within each circle on the diagram are the scale degrees, e.g., 1 represents the root note. The numbers to the left of each fret are the fingers used by the fretting hand to play the notes. 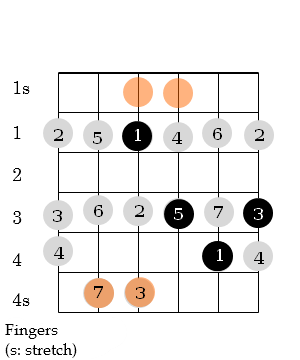 1s and 4s indicate you must stretch outside the 1 finger per fret position. 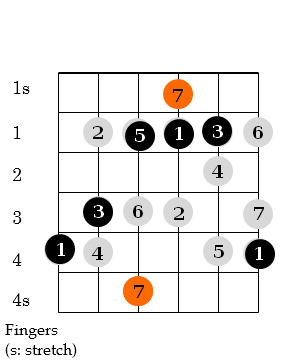 The orange circles are notes where you must stretch beyond the 1 finger per fret rule. I always stretch with my pinky. You only need to stretch either up or down, not both. Circled numbers at bottom of tab are fingers of fret hand.